metal or bamboo skewers- if using bamboo skewers soak them for 20 minutes before using. 1. Process the scallions, cilantro, garlic, olive oil, lime juice, salt, and pepper in a blender until smooth. 2. 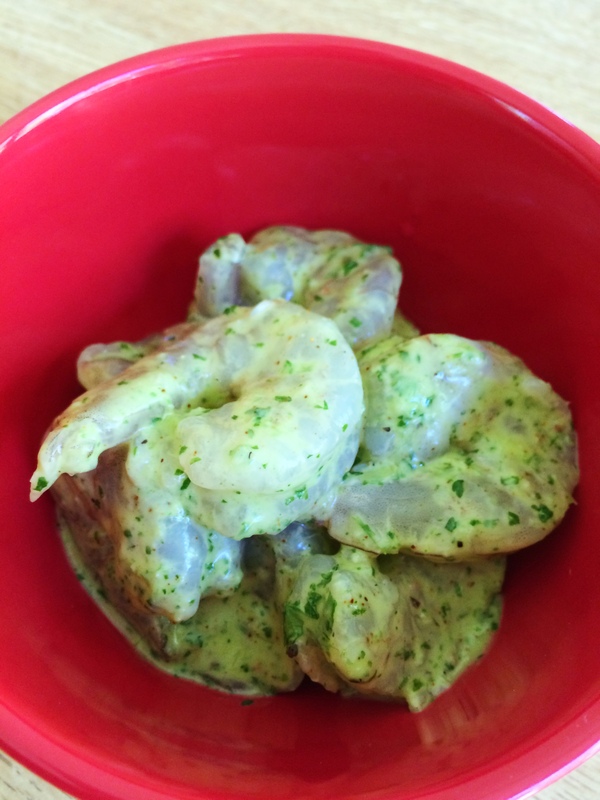 Pour the the marinade over the shrimp, cover, and place in the fridge for 1-2 hours. 3. While the grill is heating, skewer the shrimp. Cook the shrimp about 2 minutes per side or until the shrimp becomes pink and is no longer translucent. 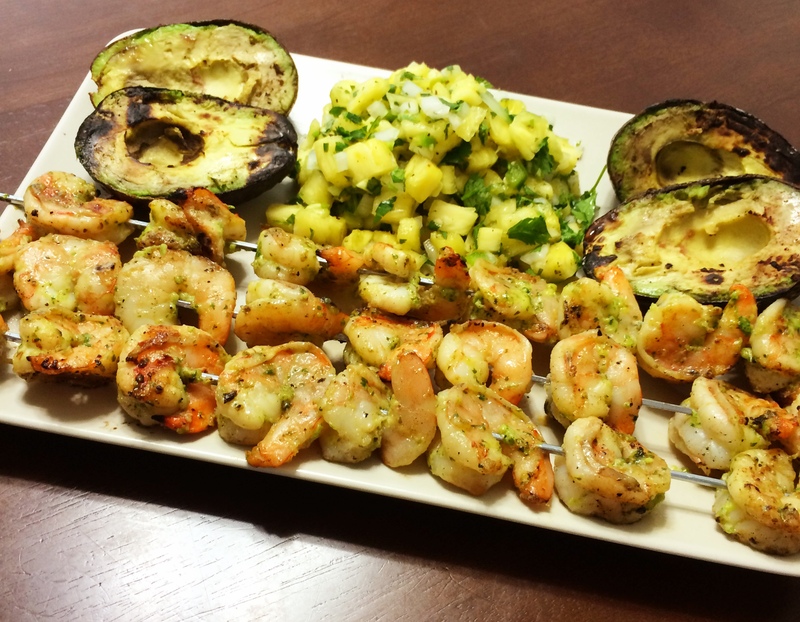 Serve the shrimp skewers with Pineapple Salsa and grilled avocado. To make the grilled avocado simply slice a ripe avocado in half and remove the pit. 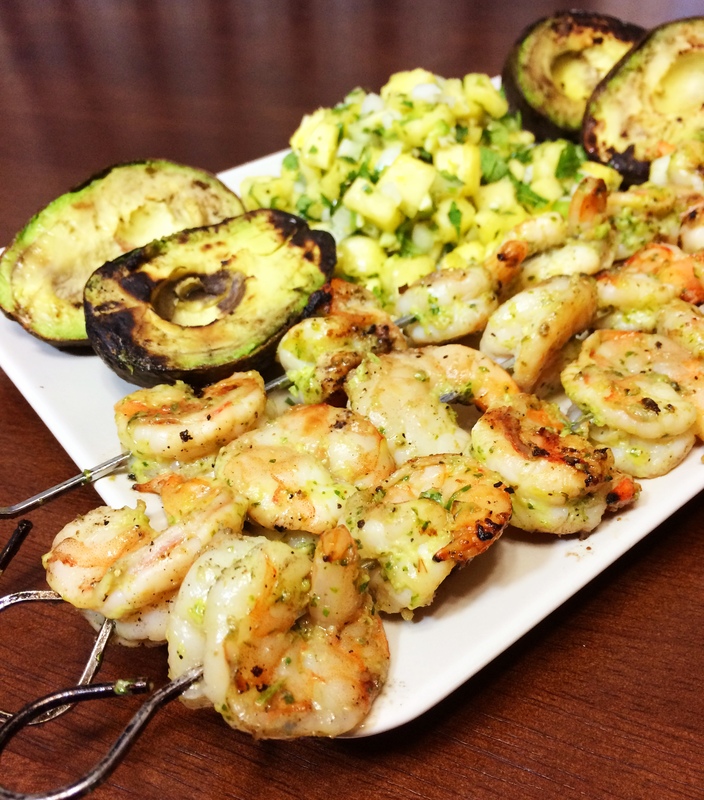 Squeeze some lime juice over the avocado halves then simply gill them over the heated grill for a couple of minutes or until they are slightly browned and warmed throughout. Open the can of salmon, drain the liquid from the can, and transfer the salmon to a mixing bowl. 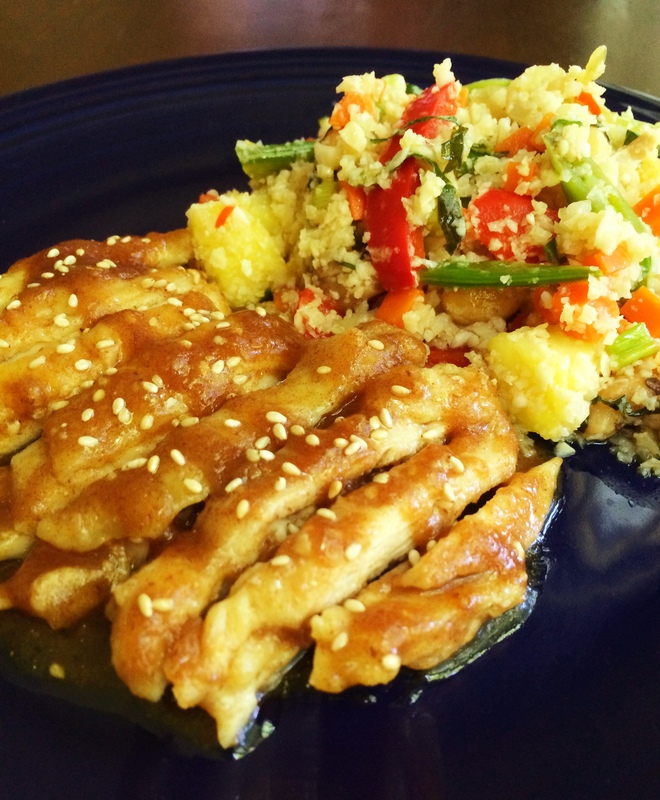 Use your fingers to break up the fish into flakes and remove the bones. Add the remaining ingredients to the salmon and mix well with hands to combine. 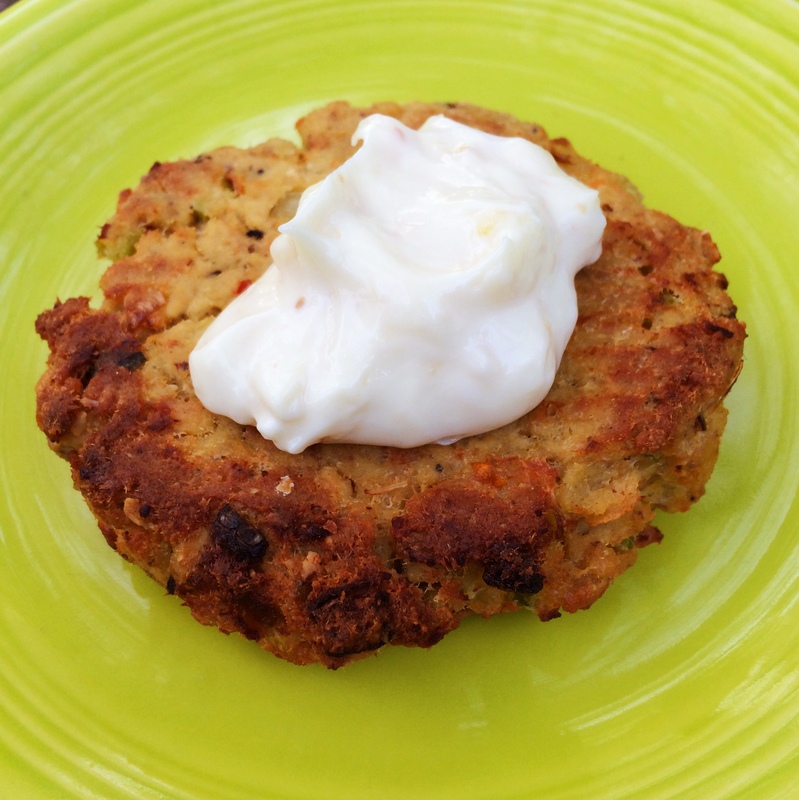 Measure about 1/3 cup scoop of the mixture and form into a patty that is approximately 1 inch think and 2 inches wide. Continue making patties until all the mixture is used- it should make approximately 4-6 patties. Heat a skillet over medium high heat and melt the ghee. Add 3-4 patties at a time (or whatever will fit) into the skillet and fry each side approximately 3 minutes or until browned. 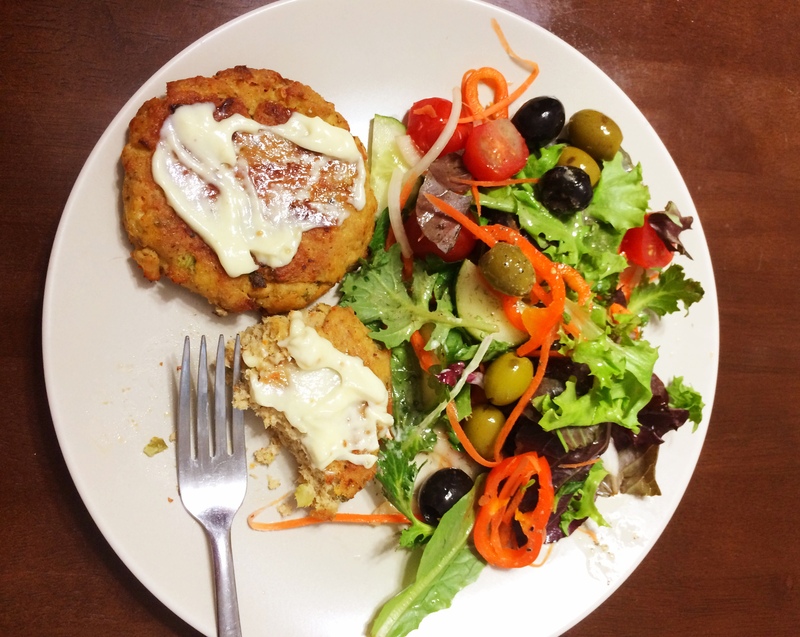 Continue cooking all the salmon cakes until they are all finished. 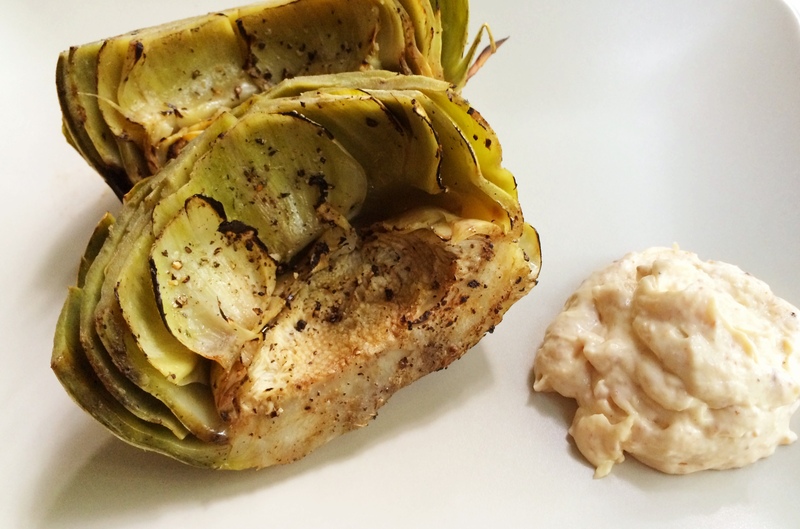 Serve with roasted garlic aioli and lemon wedges. Place 6 cloves of garlic (peels still on) on the foil and drizzle with a little olive oil and a small sprinkle of kosher salt. 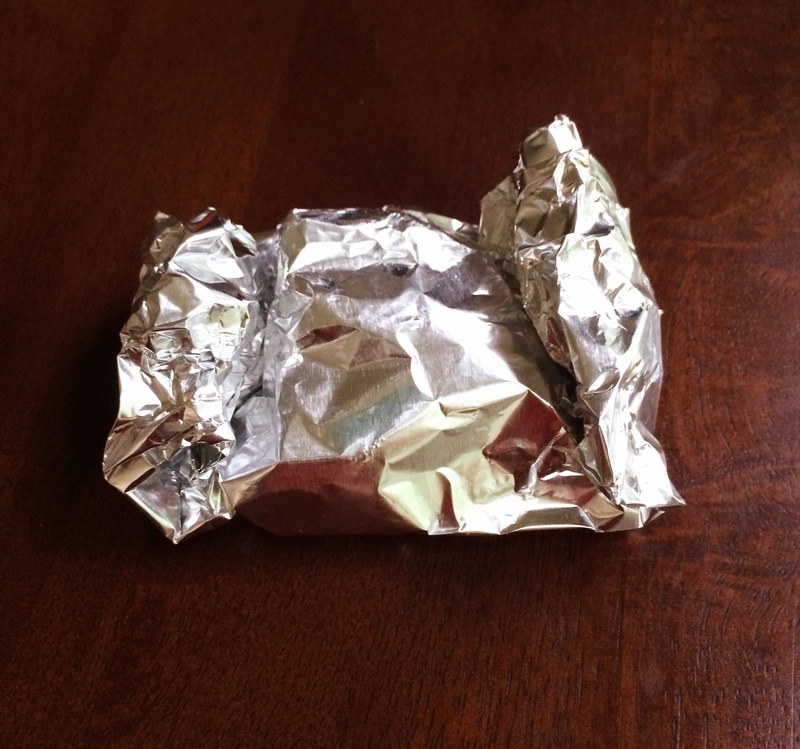 Fold the foil into a packet and place in the preheated oven. Roast the garlic in the oven for approximately 35 minutes or until the garlic is soft and slightly browned. Let the garlic cool for a little while before removing the cloves from the peels and smashing and chopping until the garlic is in small pieces. Fry the bacon over medium heat until browned and crispy. Drain the bacon on a paper towel and reserve the bacon grease. Once cool enough to handle break the bacon into small pieces. Pour the bacon grease into the spouted measuring cup and then pour in the olive oil until 1 cup of oil is reached. Pour the oil on top of other ingredients in the blending cup. Mix in the garlic and bacon pieces into the mayonnaise until well combined. Roasting garlic is simple and easy. I love roasting garlic because it makes it soft, creamy and it brings out the sweetness of the garlic. 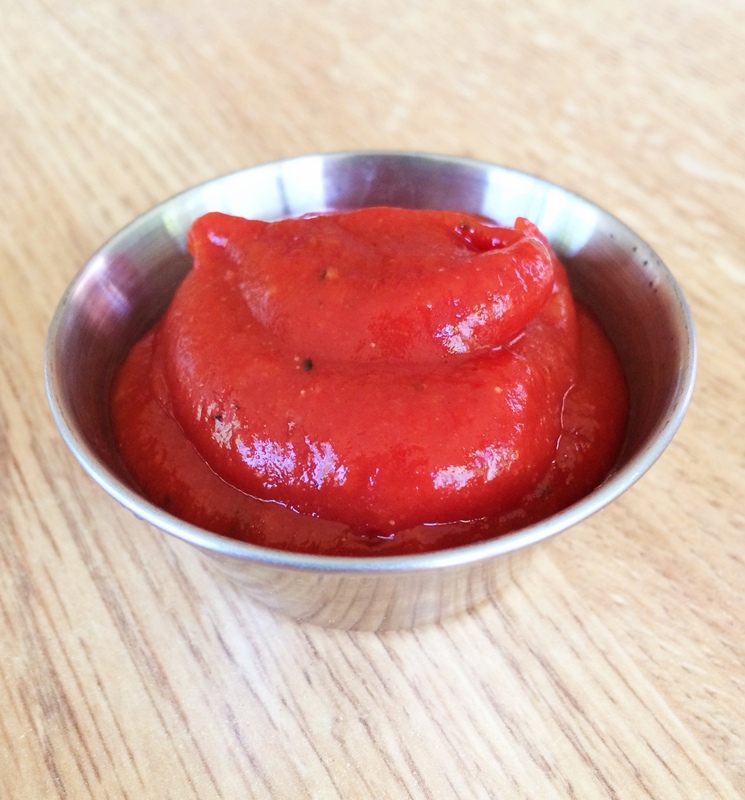 Once roasted it can be added to sauces, condiments, or it can be used as a spread all on its own. Some people will roast an entire bulb of garlic at a time but I find I never need that much so I only roast the number of cloves I need at a time. If you do roast the entire bulb then you can slice off the top 1/4 inch off the tops so the cloves are exposed then adjust the roasting time to a bit longer- about 50-60 minutes. 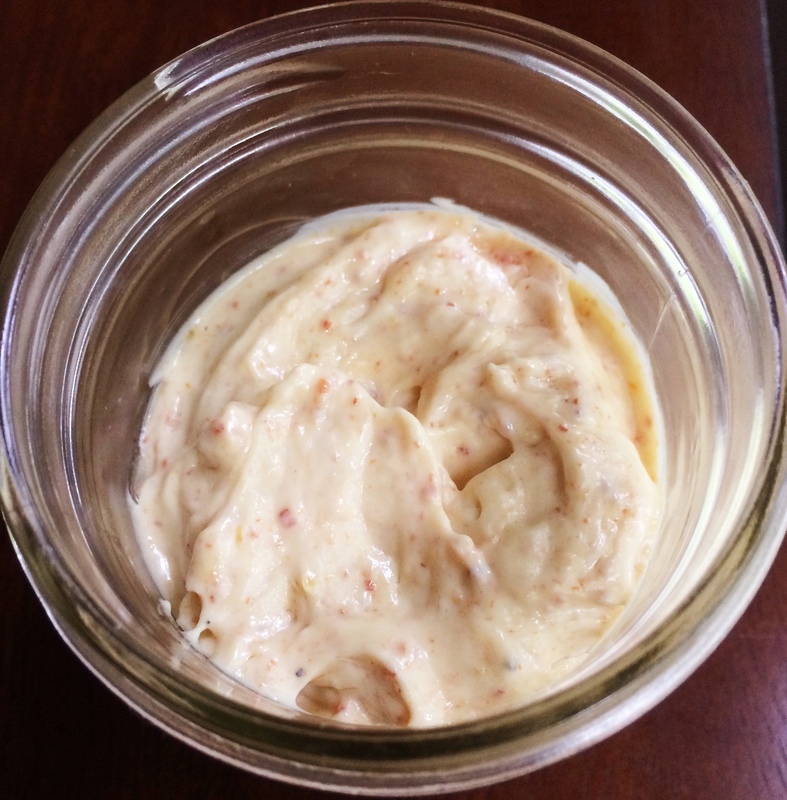 Recently I made some delicious Roasted Garlic Aioli and Roasted Garlic and Bacon Aioli with some of these roasted cloves. 2. 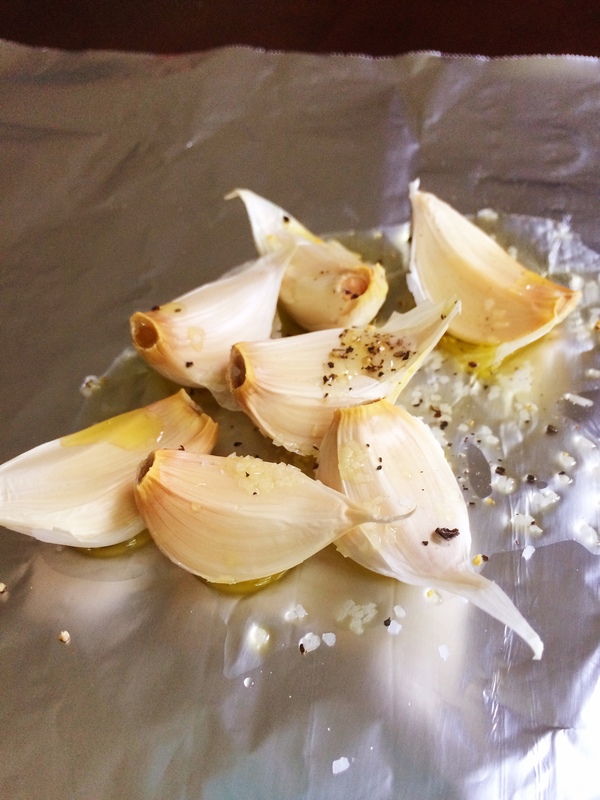 Place desired number of cloves of garlic (peels still on) onto a sheet of foil and drizzle them with a little olive oil and a small sprinkle of kosher salt and a grind or two of black pepper. 3. Fold the foil into a packet and place in the preheated oven. 4. 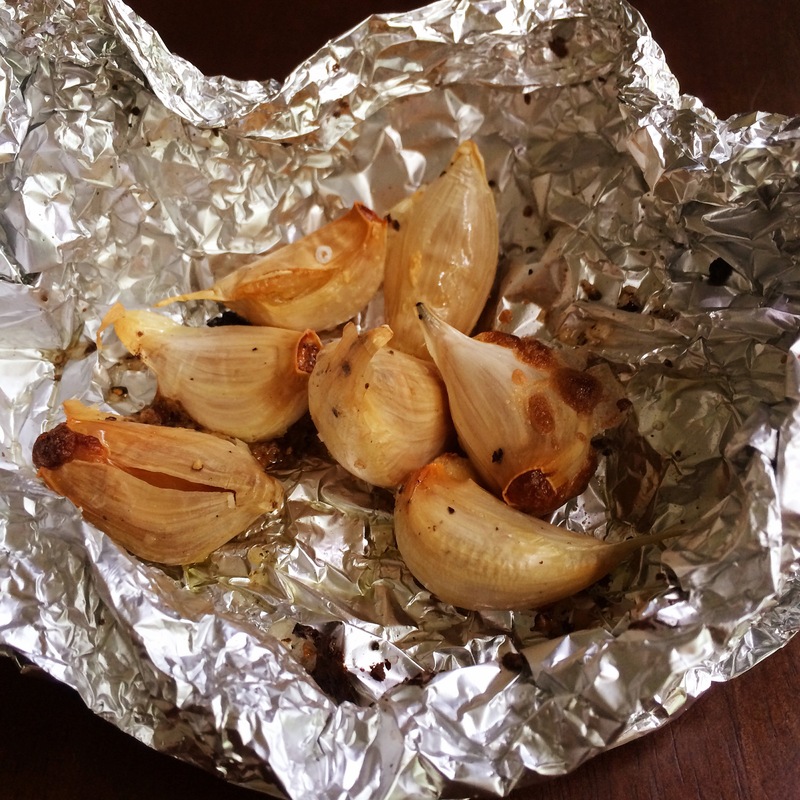 Roast the garlic in the oven for approximately 35 minutes or until the garlic is soft and slightly browned. 5. Let the garlic cool for a little while before popping the cloves from the peels. 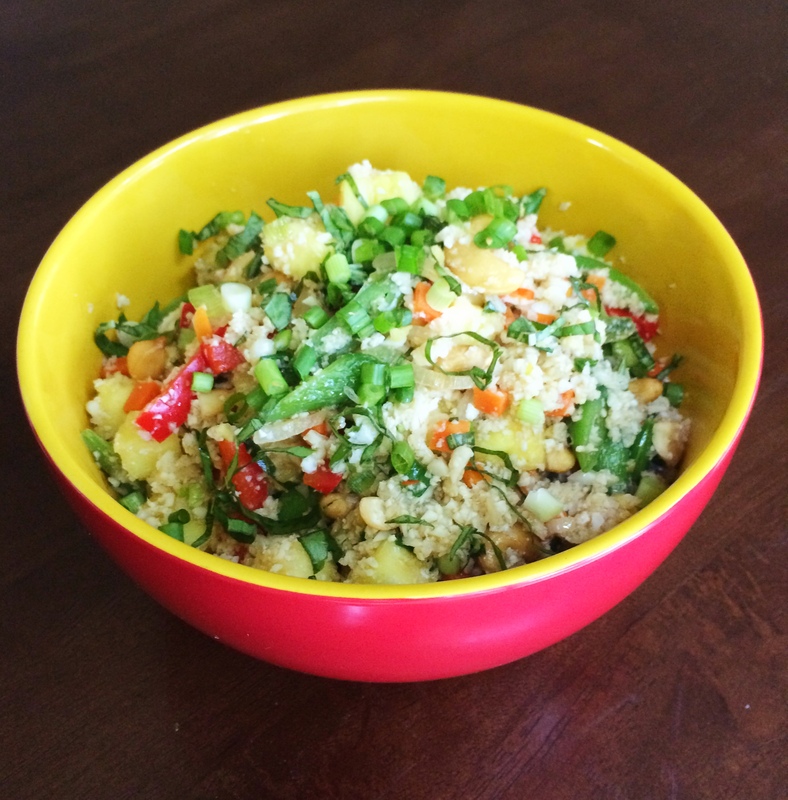 Then you can smash or chop as desired to add to the recipe of choice.